The IB Diploma and Diploma Courses programmes were first established at LIS in 2005 and since then our students have graduated with diplomas and courses that have enabled them to access university and college undergraduate courses around the world. We are committed to maintaining a respectful and rigorous learning environment. It is important for students and their families to know at the outset that the IB Diploma and the IB Diploma Courses programmes are academically challenging qualifications that are achieved with a growth mindset, effort, perseverance and commitment. The Diploma Programme is a two-year programme for students between the ages of 16-19. Students must must take six subjects, three at higher level (HL) and three at standard level (SL). 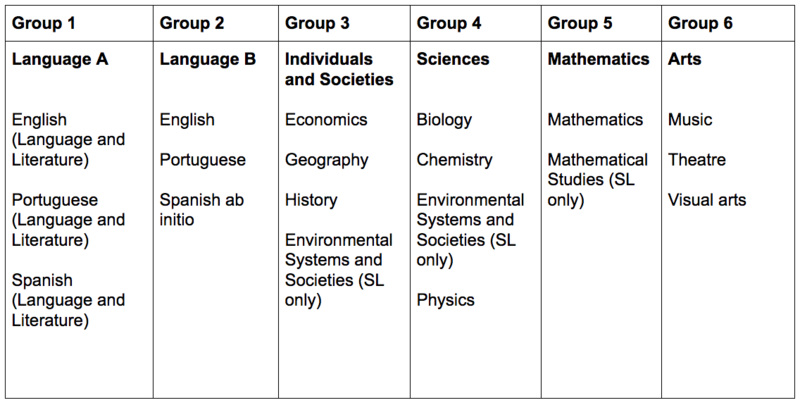 One subject must be chosen from each of the first five groups. The sixth subject can be from group 6 or a second subject from groups 1, 2, 3, or 4 can be chosen. The courses shown in the table below are offered at both HL and SL unless otherwise stated. Ab Initio language courses are for those beginning the study of a new language. In addition to the academic subjects, students will broaden their knowledge through the three Core components of the programme: the Extended Essay (EE), Creativity, Activity and Service (CAS) and Theory of Knowledge (TOK). This is to inform you of some requirements that you will need to bear in mind when you are making your Diploma choices of subjects and levels for Year 12. Theory of Knowledge (TOK) is a course about critical thinking and inquiring into the process of knowing, rather than about learning a specific body of knowledge. It is a core element which all Diploma Programme students engage in. TOK and the Diploma Programme courses support each other by sharing common skills and understandings. The TOK course examines how we know what we claim to know. It does this by encouraging students to analyse knowledge claims and explore knowledge questions. The Extended Essay allows students to participate in an independent research project based on a topic of their interest. After deciding on a topic, they will then explore it in detail from the approach of at least one Diploma Programme subject they are taking. Students will take the approaches to learning they have learned in the MYP to a whole new level by researching topics, self-managing time and communicating with their supervisors. In addition, through the Extended Essay, students live the IB learner profile as they will be using each attribute to successfully navigate the different stages of their essay. Finally, the Extended Essay serves as ideal preparation for university as it provides them with the experience of writing an academic paper on a topic, allowing them to achieve a level of mastery that will stay with them long after they have completed the IB Diploma. Creativity, Activity and Service is at the core of the DP and it is at the center of learning at LIS. Students engage in meaningful and authentic experiences that foster leadership, perseverance, initiative, and the development of skills such as collaboration, problem solving and decision making.